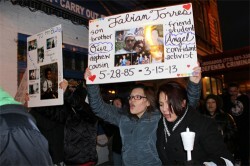 An outpouring of support enveloped mothers Asuncion Torres and Cecilia Garcia Monday night as they held a candlelight vigil on the corner of 26th and Pulaski in memory of their sons Fabian Torres and Joaquin Garcia, who were killed last Friday on Lake Shore Drive. Fabian Torres, 27, and Joaquin Garcia, 25, were killed in a car crash last Friday when North Chicago police officer Terrell Garrett struck their vehicle driving the wrong way on Lake Shore Drive. When interviewed by police, Garrett admitted to drinking earlier that night with friends for his 35th birthday. According to reports, Garrett’s blood-alcohol content was more than two times over the legal limit. Garrett was charged on Saturday with two counts of aggravated DUI and two counts of reckless homicide. On Sunday, Cook County Judge James Brown gave Garrett a $500,000 dollar bond and ordered Garrett be electronically monitored until the trial, which angered family of the victims accusing Judge Brown and the police department of being discriminatory and lenient. “Had I done this, had she done this [pointing to Garcia], had anyone else in our community done this, they would have been locked up, not under house arrest! This is wrong,” said Torres. Garrett has been a North Chicago police officer since 2008. Since Friday’s fatal accident, North Chicago Police Chief James Jackson has placed Garrett on administrative leave. “He [Garrett] gets to go home to his daughter. He gets to go home to his family, but my son will never come home. He will never walk through those doors,” said Garcia. “I am outraged. Instead of planning my son’s graduation party, I now have to plan his funeral arrangements.” Garcia’s son, Joaquin was close to graduating from Malcolm X College’s surgical technician program. Torres’ son, Fabian was a freshman at DePaul University.